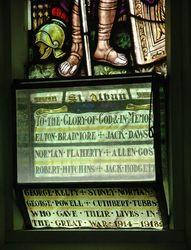 A stained glass window commemorates those who died in service or were killed in action during World War One. The window lists 10 names. A gratifying function took place at Cressy last Tuesday, when a memorial window to the memory of Rev. J. M. Norman and Mrs. Norman was unveiled in Holy Trinity Church. The window is by Mr. William Montgomery, of Collins-street, Melbourne. An order has been sent for another window in memory of the Cressy boys who fell in the recent war. It will be carried out by the same artist, and it is hoped it will meet with the same appreciation. Examiner (Launceston), 15th October 1920.